I don’t have a problem with what hooks said. She is a cultural critic and that’s what cultural critics do…deconstruct popular images. “Cultural critics define the (often political) reasons why a certain aesthetic or cultural product is more valued than others. In doing so, they examine value hierarchies that have been established within such categories as class, race, national origin, gender, sexuality, feminism.”–dictionary definition. 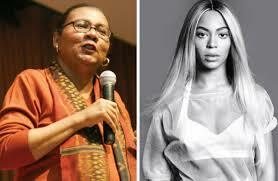 bell hooks critique of Beyoncé is no different from her views on Tina Turner (who Beyoncé borrows heavily from) and Madonna, back in the day. I’m sure it’s hard to grow older as a woman in the Entertainment Industrial Complex. It’s probably why Beyoncé pushes so hard to stay around. Even Madonna (the queen of reinvention) eventually was weeded out. And we see what they did to Janet. Beyoncé’s new music would be interesting to me, if she genuinely tackled these issues. Instead we get lines like “eat the cake, Anna Mae” in her quest to stay relevant. She really needs to take some time off and reevaluate her image/music. Her urgent desire to stay popular is making her put out all kind of bizarre images that are inadvertently affecting young black girls. They are the collateral for her to stay rich and famous, I think that what hooks was trying to say.